The first time I tried Pesto Pasta, it was with the pre-made dry sauce mix. I am not a basil-aholic, so I was surprised by how much I loved it! Then this spring, I bought a basil plant. We put basil in everything and I still couldn’t keep up with its production of leaves. This was when I decided I needed to make my own pesto. 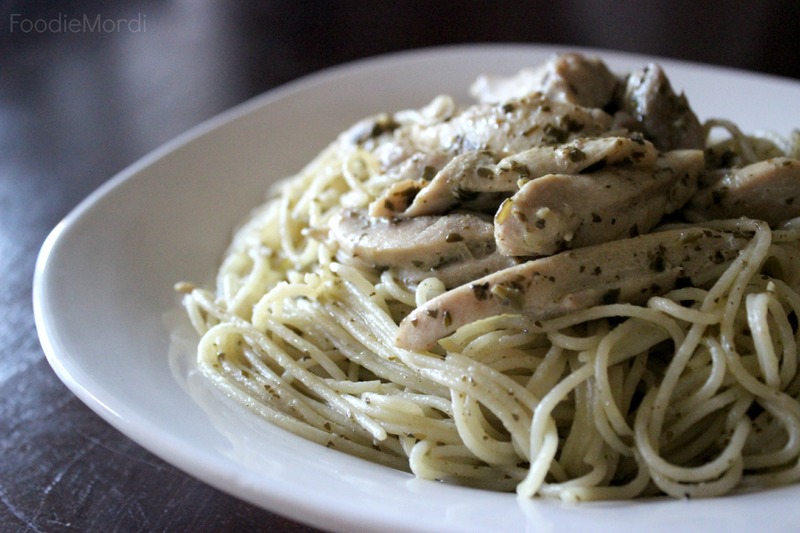 I threw in some extra ingredients to make it creamy, then put it on top of chicken and spaghetti, and my Creamy Pesto Pasta was born. I was concerned that my boys wouldn’t like it (pesto just seems like a girl food), but they were gung-ho about it! I made it again at a later time, after my basil plant died, so I used jarred pesto. While it was still acceptable, it was nowhere close to tasting like the fresh pesto I made the first time. If you have the fresh basil leaves, use them! Pulse the basil leaves in the blender with the walnuts, garlic and olive oil. Once finely chopped, add the Parmesan cheese and pulse until well incorporated. Boil the spaghetti noodles according to the directions on the package. Meanwhile, in a large pot or skillet, saute the chicken pieces in a little oil, over medium-high heat. Once the chicken is no longer pink, add the pesto, and continue to saute until it is fragrant. Add the chicken broth and sour cream, and stir to combine. Leave to simmer until it is heated through. Drain the noodles, once cooked. Put the noodles in the sauce and turn to coat. Serve immediately.